is a community-based learning center in Hadley, MA. Instead of going to school, our members direct their educations to fully explore their interests and passions, just like Matt and Logan are doing. We think Matt and Logan are awesome! The Virtual Learning Academy Charter School is New Hampshire’s first statewide on-line virtual public school. The Academy’s goal is to use the latest internet technologies to provide students with any time, any where access to a rigorous, personalized education that helps them learn today, graduate tomorrow and prepare for the future. The Virtual Learning Academy provides free classes to New Hampshire residents and accepts out-of-state students on a tuition basis. The school serves both part-time and full-time students. Please visit our website and check out our course catalog today. http://www.vlacs.org Mr. Winkler and Logan: We are very impressed by the journey you have undertaken and we are happy that we can provide support to you through our online courses. What a wonderful opportunity to learn through experience! I’m sure that this will be an adventure that you both will remember for the rest of your lives. Good luck! The following individuals, groups and organizations are not our “sponsors,” but we want to help promote them, anyway. What do you learn in school? Math, science, business, industrial arts, and so on. Guess what? That’s everything you need to create a skateboard! Click on this link to bring the create a skate curriculum in a box to your school! BONUS: you walk away with a skateboard deck that you designed and made yourself. 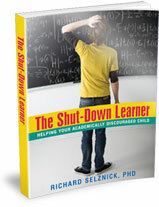 The Shut-Down Learner: Helping Your Academically Discouraged Child by Richard Selznick, PhD. compares ‘spatial’ intelligence (applies to Legos, puzzles, gears, wires, etc.) with language-based skills (reading, writing, etc.). He writes, “It is devastating in school to have the combination of high spatial skills and weak language abilities.” because “School is heavily loaded on the verbal skills side of the continuum. There is a clashing of brain styles between the curriculum of school and the high spatial skills of the SDL (Shut-Down Learner).” He offers valuable suggestions for preventing or reversing the scholastic “shut down” of kids who fit this profile, and lots of encouraging real-life stories from his many years of experience in this field. (He doesn’t mention cross country trips, but it’s working pretty well.) I wish I’d read this book a year ago. Garden Sk8 Indoor Skatepark– a great skatepark that hooked us up with some equipment! Thanks, Bossman! this company hasn’t been put up yet but in a month or so it will be i saw you at charm city yesterday and you were pretty good and we are Fail Skateboards soo ya bye! First of all, way to go! This is one of the coolest ideas I have ever heard and I am SURE that in some ways you will learn more this year than your other years of school combined!